The story of the Wynyard escalators can be traced back to the early 1900’s. Engineer John Bradfield outlined his vision for Sydney in his thesis: “The city and suburban electric railways and the Sydney Harbour Bridge”. His plan was to create a bridge connecting the city to North Sydney, electrify trains and create an underground rail system. Like most escalators at the time, the Wynyard escalators were installed with wooden steps. They stayed there for 80 years until they were removed and replaced with steel steps in January 2017. 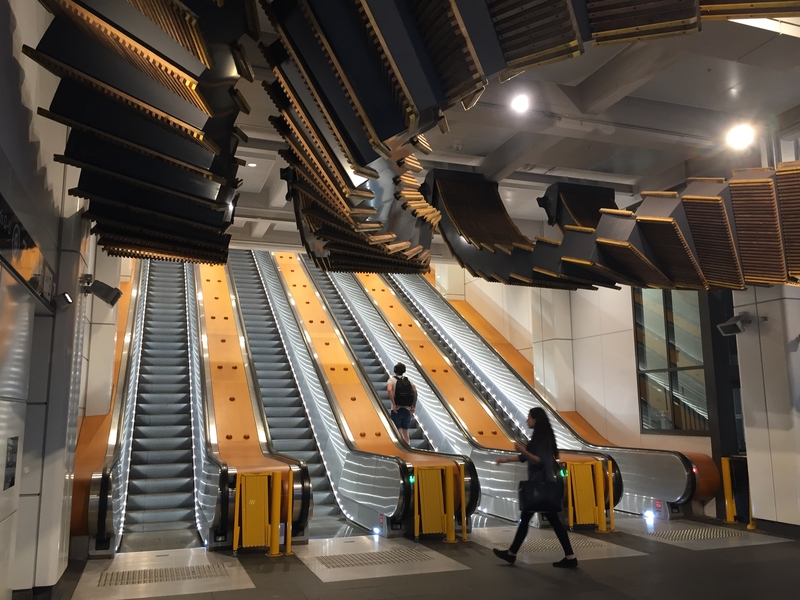 While some were worried they’d seen the last of the wooden escalators, Transport for NSW were busy ensuring the heritage-listed steps would live on in another capacity. Transport for NSW called on three artists to pitch proposals for a heritage interpretation of the wooden steps. The winning pitch came from Chris Fox and his artwork Interloop. Interloop opened in December 2017 and was an immediate hit online. Alex McKinnon from The Guardian called it a “rare win for public art in a city that can leave you cold.” Reddit users called it “peculiar”, “dazzling” and “grouse”. I declared 2017 the year of the escalator. As a commitment to the quality and authenticity of my escalator journalism, I knew I couldn’t make an episode about Interloop without first seeing it for myself. So one weekend in April, I packed a backpack with 7kg worth of carry on luggage, and took a trip to Sydney. Hear more from Chris Fox in the seventh episode of People Movers. Listen via Omny, iTunes or your podcast app of choice. This episode of People Movers is about escalators and art and their unlikely combination at Wynyard Train Station. For this episode I spoke to the Sydney based artist, Chris Fox. C: I make large-scale sculptural projects often installations. I work with particular sites or locations and often manipulate the materials or the fabric of the actual area and then make an installation out of that. I pitch for these large-scale public works and commission works all the time but this was quite particular because it was in relation to it being a heritage interpretation, but for me the interest was purely about the escalators themselves. C: Wynyard and Town Hall Stations in Sydney had some of the last remaining wooden escalators in the world. The Wynyard escalators were removed in January 2017 and the Town Hall ones only a few months later in August of the same year. Both were replaced with steel steps because of safety. Wooden steps are a significant fire risk and the claws of Guide Dogs used to get stuck in the wooden treads. The old wooden steps of Wynyard were heritage listed and given a second life by Chris, who turned them into the artwork Interloop. C: So Interloop was a competition that Transport for NSW ran and I was invited along with two other artists to pitch a proposal for Wynyard Station for the escalators of York Street. The old escalators were getting removed and they wanted to work with some parts of the old escalators to develop a heritage interpretation project. So the competition asked these three artists to work with these heritage treads and either some other components of the escalators. My first proposal really avoided that and actually proposed something pretty ambitious that was floating above the escalators and that then started a whole conversation in the competition stage where it was sort of outside of what they had initially said but they started to like the idea and then we started to work together and then I re-pitched it again, something larger that was on the lower section and then that enabled me to win the competition and then I went through from there and started to develop the project in more detail. C: Initially I was asked to look at it just at the end of 2016. So December, almost Christmas in 2016, and then I pitched something early in January-Feb. It was so funny as soon a I got asked just on Christmas Eve when I got the first call to pitch for it, I almost could see it, it was really weird, it was just that thing they said ‘oh it’s a project for Wynyard Station working with the old timber escalators of York Street, the really long ones’ and I’m like oh my god that’s awesome and I could just see this floating stair thing in my mind and I think to work with that sort of material and that sort of geometry, it was awesome to be able to do that. Now I have a question for you: what do the Wynyard escalators and the Sydney Harbour Bridge have in common? The answer is one man: JCC Bradfield. Bradfield was an engineer. He completed a Bachelor of Engineering at Sydney University in 1889 and then went to work for the Queensland Railways Department and the NSW Department of Public Works. In 1912 Bradfield went before the Parliamentary Joint Standing Committee on Public Works to pitch for a bridge between the city and North Sydney. These days it’s hard to imagine Sydney without the Harbour Bridge or that there would be any opposition to building one. Although the Committee supported Bradfield’s idea, the First World War put a pin in any further developments. The bill that would give the green light to the project failed to pass the upper house in 1916 because all state funding was being directed to the war. But Bradfield didn’t give up and in 1922, with the War well and truly over, the Sydney Harbour Bridge Act was passed by the New South Wales parliament. And this is where the trains come in. Bradfield outlined his vision for the city in his thesis: “The city and suburban electric railways and the Sydney Harbour Bridge”. In Bradfield’s mind – the Sydney Harbour Bridge and the the trains were part of the same project: you couldn’t have one without the other. Part of Bradfield’s vision for Sydney’s trains was to make them electric and to create an underground system. The first underground stations were St James and Museum which both opened in 1926. The Harbour Bridge was opened in 1932 which connected the North Shore Line to our old friend in the city – Wynyard Station, which opened in the same year. Circular Quay was the last station to open in 1956 making the City Circle complete. And what made these underground train stations like Wynyard possible? That’s right – it was escalators. The York Street entrance to Wynyard Station has four escalators. Three of them were installed when the station was opened in 1932 and a fourth was added in 1952. From the outside, the York Street entrance to the station is fairly nondescript and some might say – a little ugly. When you enter the station from York Street, the escalators are on your left. But because the escalators are so long, and Chris’s artwork is right at the bottom, at the top you can’t actually see it. But once you get about three quarters of the way down you start to notice it. It starts with the landing plates where you step on and off. They’re attached to the ceiling, parallel to the escalators on the ground. The tracks start off straight and then merge with one another into an accordion shape, all looped together in the air. When it first opened, Interloop was getting attention from a whole lot of people, not just escalator lovers like me. I first saw it on Instagram and knew I had to do an episode about it. So one weekend I booked a flight to Sydney and went to see the artwork for myself. As I was on my way there I had butterflies in my belly like when you’re visiting a new place for the first time and you finally get to see in real life, the thing you’ve only ever seen represented in photos. I felt the same way in Paris and London and Berlin where I felt like I knew the places so well without ever visiting, based on only ever seeing photos. But this wasn’t Paris or London or Berlin, this was an escalator. Okay so technically it was four escalators, but it was an escalator no less. And unlike in Paris or London or Berlin where people expect you to take photos and walk around with a big smile on your face, I felt a little silly doing that in an old train station. Luckily for it was fairly quiet given that I was there on a Saturday afternoon and most of the commuters who frequent the station are probably more of your weekday peak hour types. I rode up and down a few times trying to get photos of different angles and trying to imagine the escalators on the ceiling being installed in 1932 and then being walked on for the next 80 years. Now I’m not from Sydney but having access to history like this made me feel like a bit less of a stranger to the city. L: Has this project made you feel a bit more connected to Sydney in a way? C: Yeah I mean I’ve been practising for over 20 years now making sculpture and installation work and I’ve done a lot of large scale permanent public works around Australia and internationally but I haven’t done anything that’s really in Sydney city and that’s what’s been amazing with this project is that firstly doing a project at such an amazing location right at Wynyard station with so many people underneath it and seeing it every day but I think it has really reinserted my interested into things like the way the train system has been developed over time and that’s what quite interesting. Thinking about them in terms of the logic of these underground stations and when Bradfield first designed that idea of the City Circle and how each of the train stations would operate, to even do that because of the topography they had to be really deep and only because of the escalators that those proposals were even possible really, because they started to talk about how can you move people from such lower levels at capacity. That’s what’s so interesting about them, that they started to transform how cities were planned. So they’ve got a pretty amazing relevance to the way cities are thought about I think. I remember traveling on the wooden escalators at Wynyard. It was in 2014 and my Mum took my sister and I to Sydney for the weekend because we’d never been before. We stayed at a place on King Street which was just around the corner from Wynyard Station. Now unfortunately 2014 me wasn’t as interested in escalators as 2018 me, but I remember at least acknowledging that the wooden escalators were different from the ones that I was used to back in Melbourne. Now that’s one very small memory based on just one visit, but what about Chris? C: I mean I think that’s what’s been so overwhelming, after the work was open, because we had to keep everything really under wraps, no one really knew what was happening with it and it was just installed and then revealed to the public on the Monday just by people walking under it and going ‘what the hell I’m sure that wasn’t there Friday’ and from that moment I think people have been so captivated by it, partly because of all the other elements that are hopefully going on with the work but I think mainly due to that material itself. C: Like it’s got such potency in the city, it’s sort of embedded in the fabric of the city, it makes up a cultural identity of the city. I imagined there would be a fondness for it but I had no idea of the sort of potency of it until it was completed. Countless stories of people emailing me or contacting me or even when I was down at the station over the first few weeks when it opened and people saying ‘my dad used to come down to Wynyard when they first opened them’ or ‘my grandfather did’ or whatever the story was and some fantastic stories about this, the fact that they were the first escalators in Sydney of that length and they had this amazing thing of these moving stairs that people would go to and I think there’s such a fondness for it that ties back for eight decades, it’s a pretty amazing lineage in a way. C: Maybe even with this project it really highlights that something like the treads that they’re walked on and their relatives have or their friends and there’s this sort of generational connection to the material. I think it opens up this idea around it being for the people or of the people and I think that’s something that hasn’t been discussed directly in terms of people’s response to me but I sort of have a feeling of that, of like they have ownership over it as much as the station or Transport or me the artist. The material is something they’ve really touched and walked on and got their heels caught or whatever it is their experiences of the material is, and I think those materials are really important for people and I think often it’s not discussed, people are not really aware that they are that connected to it or they have a right to them in a way. I think that’s what’s interesting about these creative projects or something that’s more poetic that’s talking about that, is that it opens that discussion up and brings something else to the city I think. It’s pretty exciting. You can learn more about Chris at chrisfox.com.au. You can follow People Movers on Instagram: we’re at people movers podcast. Full transcripts and more information can be found at peoplemovers podcast dot com. You can find it on iTunes or your podcast app of choice. Once you’ve done all that – you can leave me a nice review and tell your friends.